If you're going to thrive as a Christian - and not just survive - God has to be bigger to you than anything else. This is the normal life He intended you to live. Now, it's not normal in the sense that it's common, but it's what every believer should be walking in. Do you remember when God first touched your life? Even if it wasn't a dramatic experience, you remember what it meant to you. The impact of that experience should never be diminished. When God touched my life on March 23, 1968, I had an experience with God that changed me forever. If you've been listening to me for any length of time, you know I refer to this encounter quite a lot. Why? It's my testimony, so I'm going to stick to it! But the truth is, it was real to me. I mean, I felt like I could reach out and touch God. I know I'll never be the same. You might say, "Well, that's because you haven't had any problems like I've had." Believe me, I've had plenty of opportunities to diminish what God has done. My life hasn't been a walk in the park. The reason I talk so much about the experience I had with God is because it's still big to me! It has not lost its impact. I'm still on fire after all these years. I have a relationship with the Lord that's vibrant. And you know what? It doesn't matter what happens, what the devil does, or anything else. I'm going to keep this excitement. I'm going to thrive. You can be the same way. 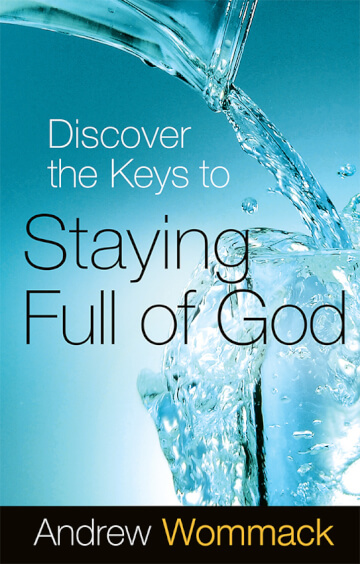 I encourage you to get my Discover the Keys to Staying Full of God teaching. You don't have to settle for what passes as normal in Christianity. Be intentional and grab hold of these truths, so you can start seeing positive change in your life. I've got this teaching in CD, DVD, book, and study guide formats. Order today by going online: www.awme.net or by calling the Helpline: +44 (0)1922 473 300. You'll be glad you did!